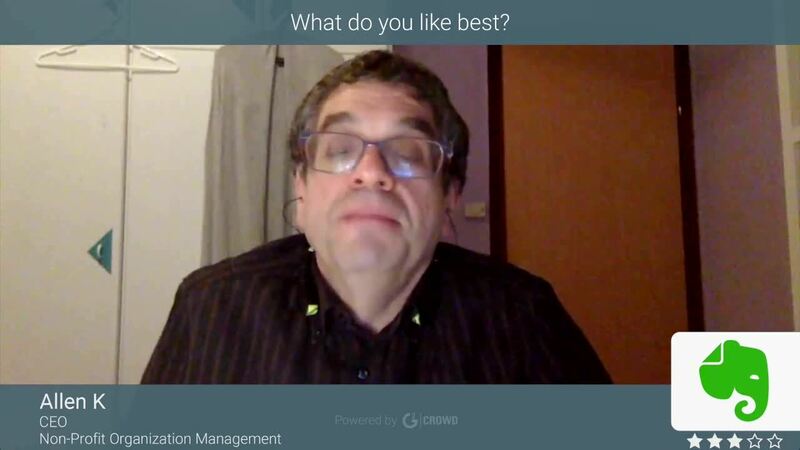 Do you work for Evernote? Evernote helps you capture and manage ideas, projects, memories, and to-do lists, so nothing gets missed. Write notes, attach documents, scan images, take voice memos or clip from the web. Organize everything from big projects to personal moments in a single place, accessible on your computer, tablet, or phone—even when offline. Quickly find the information you need with a powerful search that recognizes words in handwriting, images, and attachments. With Evernote, you can focus on what matters. Learning about Evernote? We can help. "I use Evernote as my digital file cabinet"
Best part of this application is that this application has scribble handwriting where you can scribble down your own words quickly and note it down in your list of events. This application also has a smart camera. The smart camera helps m to quickly scan my documents and save them in my phone or in my organizing list. It properly scans the document, applies the the right filter and the brightness an also crops it to its right size. Its a very helpful feature where i scan my everyday documents and get my work done on the go. it also has audio notes, now I can quickly record voice and save it in my list. In addition to these extraordinary features, I can even Put attachments and set reminders. This application works so well that i actually did not find anything disliking neither did I fin any drawbacks. All these features in the application work so well. But, I feel that evernote must try adding keyboards of different languages in the application. For users from countries like india, where people speak variety of languages, it is essential to upload keyboards of different languages so that they can carry out their work easily. This application is extra ordinary and very productive. For those who are looking out for application for management of your daily routine or management of your work in your company, this application is the best and I personally suggest everyone to use it. i usually make lists of all my important documents that i need for daily use in my company. I also make list of machining operations that have to be carried out in my company in dally routine. It helps us out to plan all the work correctly and sequentially. Lo que más me gusta de Evernote es que es una de las aplicaciones más utilizadas hoy en día, lo que ayuda en el trabajo de integración en la empresa. También es muy positivo por parte de Evernote que sea gratuito y funcione en todos todos los soportes, PC, Ipad, Android, IPhone, etc. Y sus posibilidades están muy bien adaptadas a cada soporte. Entre los aspectos menos buenos de evernote encontraremos que: la versión gratuita es limitada. Solo en la versión de pago puedes guardar archivos Word, Excel, etc. Además, la sincronización de los archivos a veces falla, por utilizar ordenadores poco potentes, o por intentar cargar archivos muy pesados Y por último, mencionar también que en el Ipad Evernote te muestra las libretas para ordenar la notas, pero no así las etiquetas, que debes aprendértelas casi de memoria. Muy recomendable para aquellos que quieran mejorar en organiza sus ideas e información. Nos permite en nuestra corporación anotar, guardar y organizar todo tipo de datos útiles gracias al empleo de notas a las que les puedes añadir etiquetas.Hemos mejorado en organización y por tanto en productividad. "The best way for taking notes"
Sometimes you suddenly have an idea, and you need to write it down, and Evernote is the best way to do it, as this app allows you to create and share all kind of notes, you can add text, images, videos, audios and more. Evernote even let you organize everything with folders and labels, which is handy so you know where your notes are on any moment that you need them. The Evernote's app is excellent, is not only user-friendly and highly intuitive but also it is available for any device, mobile or desktop. You can also set reminders and to-do list, so all of your coworkers can share notes about the work that needs to be done and the work that is already done. Evernote is great, but it has some serious flaws, in one hand, it appears not to be as secure as it should, and that's a big problem when you are working with some sensitive data. On the other hand, the storage capacity can be limited sometimes, especially when you are working with multiple notes and files. Also, if you don't have internet access, it is problematic to follow the registration and activities of the Evernote's app. You will just have to give it a try, as is easy to use, really intuitive and will become the right hand of your creative team. 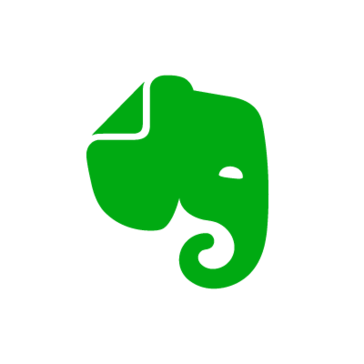 Evernote has been helpful when organizing the work team and creates quick notes when meetings and brainstorming occurs, is a powerful app that helps you with notes creation, file storage and more, without the use of any third-party software. You can also share folders and notes with co-workers or clients, and keep a track on every modification that they do on the notes, which is handy to be connected on the same page about the work that needs to be done. "My digital notebook for daily use at work." In order to effectively fulfill my labor obligations, I require several software that facilitate the fulfillment of my functions; one of the software that I use the most is Evernote, which is a digital notebook with very interesting functions and characteristics that allow me to fulfill my goals at work. Among the most outstanding functions and that more use of Evernote we have the record of notes related to my work dynamics, thanks to this function I can attach ideas, instructions from my bosses, upcoming activities, reminders, photographs and many more things. This software has a very elegant and clear interface that allows you to use each one of its options and take advantage of the maximum potential that Evernote offers. Being one of the most used digital notebooks in the world, always has good updates tailored to the needs and demands of the people who use it. Evernote is my ideal companion at work because it allows me to meet my work objectives in a more effective way. The more I use this software I convince myself that it has no defect, on the contrary, thanks to this software I have been able to enhance my performance in the company where I work, since the use of a notebook for the fulfillment of my work objectives is extremely important. Whenever I have the opportunity I recommend the use of this software because it is very important to have a notebook to record each of the events and important activities in your work, this in order to use these notes to make better work reports, systematize the activities you have to develop and note the most important ideas of a meeting to which you attend. A very useful software for me and that's why I always recommend it. When I think of how Evernote has contributed to my work, I feel very satisfied. It is thanks to this digital notebook that I have been able to improve my skills on the job because Evernote offers me many interesting features that I use every day in my work to improve. A software that brings many positive features to my work environment. "Evernote la mejor solución a la mano"
Evernote me permite tener todo a la mano, ya que lo tengo instalado en mi móvil y pc, donde puedo apuntar todo lo que es de importancia, y lo mejor de todo es que es compatible con cualquier sistema operativo y ademas cuenta con extensiones en navegadores de mi uso personal y de trabajo, teniendo así toda la información a la mano. Tiene buscador, donde se puede ubicar justamente lo que se necesita al instante, y también se puede integra notas de voz y documentos lo que mantiene una información compacta y fluida. La sincronización cuando el internet falla o me encuentro en algún lugar donde no poseo conexión, no puedo acceder a mis notas, seria recomendable pensaran en habilitar una sincronizacion sin conexión como en la nube.. Pero de resto todo excelente. Es una aplicación ideal para tener la información a la mano, permite crear notas integrando notas de voz y archivos que permiten una información mas solida, ademas permite imprimir y convertir las notas en pdf. Es soportado por diferentes plataformas y también en móvil. Actualmente lo uso en mi trabajo para tomar todas las notas y apuntes que se van generando día a día, ya que esto facilita mi trabajo tener en cuenta sin escaparse ningún detalle. "Take your notes with Evernote "
Have you ever had a great idea and the fact that you can not write it at that moment has been lost? Or have you written it but have you lost the note? It is quite recurrent, not only in writers. With Evernote you will not leave any great idea in the inkwell. Evernote is a very complete App of notes that allows you to leave in writing any idea or concept that comes to mind. With Evernote you can make an exhaustive management of the notes that you are taking, adding texts, images, audios, etc. In addition, it allows a very complete organization through folders and labels. Evernote is not just an app designed for mobile devices, they also have a desktop app (Windows and Mac) and a web format (accessible through the browser). In this way, whatever your way of working Evernote will become your best ally, since all the notes are automatically synchronized. The security of Evernote is very bad, I think that anyone could access your account without you knowing it, other than the storage capacity is quite limited, in itself, the application is very good, and perhaps one of the best in your area , but there are points that should be improved. Evernote is simply the best application you will find to make notes, it is useful both personally and professionally, easy to use, customizable and you can open it from your phone or computer. From the professional point of view, I elaborate and take notes of the vast majority of things that I do in my work, as people we tend to take many notes and more when we are writers, at any moment an idea comes to us and in my particular case I come quickly to evernote and write whatever is going through my mind., Another very interesting and advantageous thing is that I no longer have to spend paper to take notes, this I love because not only contribute to the environment but also to the organization of my papers, I no longer have to have a lot of papers or notes scattered everywhere. "The digital notebook of the future"
When I talk about Evernote with my co-workers I can only mention wonders of this software as it made me replace my notebooks with this fantastic digital notebook that allows me to record ideas and observations of meetings, record activities to develop, observations about the programming of our television channel and set reminders of activities, meetings and tasks or finish. Evernote is very versatile and comfortable to use since it has a very showy interface with its well specified characteristics, which makes it possible to use it to plenitude, in addition it has an application for cell phones that allows me to use it where I want while I have connection to Internet. Evernote is a last generation digital notebook very useful for companies and their workers. The only drawback I find when using Evernote is that if I don't have internet, my digital notebook becomes dysfunctional, causing me problems to follow my activities and the registration of ideas necessary to fully comply with my workday. It is important that Evernote's technical department verifies this problem and offers a better solution for the users. A software that has everything you need from a digital diary. On the one hand it has a comfortable way to write down all the observations, activities to execute and ideas you want; you can also record reminders, completed tasks, monthly schedules and other aspects that you need to improve your work dynamics. Evernote is a wonderful digital diary that I recommend to all professionals who are currently working in a company. Despite the limitations mentioned above, I must assume that this digital notebook is a novel business solution, which came to market to replace the old physical notebooks. Evernote has everything I need to technify and modernize my work performance to such a level that it improves my individual and collective performance at work. A very useful software for the fulfillment of my labor objectives. "Evernote is perfect for taking all kinds of notes"
From evernote we are fascinated by the fact that it works on almost any platform. It has a version for Windows, for Mac OS, for Linux, it has web applications (extensions for Chrome, Mozilla, safari, etc.) and mobile applications. That makes it perfect when synchronizing the notes between one platform and another. We like to be able to add videos and voice notes to documents. The system of creation of notebooks can become somewhat confusing, especially when you already have a large number of notebooks created. Note that the platform is usually not very customizable, so although we can add many things to each note, these will always be organized in the same way, and its presentation will be the same. Evernote is highly recommended when what you want is to have a quality job, easy to customize, and completely safe. We recommend it for the wide range of formats that the platform supports, including pdf files. No doubt evernote will be a good acquisition for anyone. Thanks to evernote we have much more confidentiality with our documents, since having a Premium account allows us to add security pins to enter after entering the application. In addition, its function of encrypting texts is also quite useful when sharing private information. Passwords are not even saved directly on evernote servers, so hacking is avoided. "My notes with a click." I like EverNote because it is an application for both PC and mobile devices so I can access my information from anywhere and anytime I need it, I also like that EverNote allows collaborative work and in this way my colleagues Jobs contribute their ideas when we plan together through EverNote. The storage capacity is limited and does not have passwords to protect the information. I recommend the application for making simple annotations and teamwork. EverNote has benefited me by allowing me to save time since it helps me organize all my information and recover it easily whenever I need it without wasting time searching for it, because this software has a powerful search capability, too It benefits me by allowing me to store all kinds of documents in this application without having to use special software for photos, videos, pages ... since everything is stored in EVERNOTE regardless of the nature of the stored document. "My Favorite Piece of Technology for Work"
I like the simplicity the best! I also use their Search function a lot, because I take TONS of notes! Using the Search function gets me to where I need to be quickly. And that’s important when I’m trying to jot something down before I forget it. The interface is so simple, yet beautiful. It’s not complicated or overwhelming. They offer the same text capabilities as any other document interface (formatting options, bullet points or number lists, linking, etc.). Users have the ability to upload PDFs or other documents to their notes, as well as connect Evernote to Google Drive for linking relevant projects. It also has browser extensions that allow you to save a web page, in its entirety, with just one click. Every now and then the auto-save creates a new note with the same information in. That can be a little frustrating to clean up. Just give it a try! It's easy to test and easy to move on if you don't like it. But, you will. Professionally, I have notebooks for partnerships, vendors, marketing campaigns, internal meetings, how-to’s and useful videos/articles (I use the Web Clipper for this one). Within those notebooks, I have a note for each item. Within that note, I track updates. For example, if I have a call with Vendor A, I’ll search for that vendor’s name before I hop on the call. The search function will take me to the specific Vendor A note, which is organized in my “Vendor” notebook. Within my note, I’ll record the date and purpose of the call, and then use the bullet-point function to keep track of our conversation. I take all meeting notes in Evernote, as well, so that I can easily reference them later. Whenever we have a new Feature Release, I’ll take notes in Evernote of the internal unveiling so I can easily relay the information to my clients without forgetting key points. Personally, I use it for journaling, recipes, and keeping track of important phone calls, account information, or notes from pediatrician appointments. "All the activities of my work are recorded in this digital notebook. " Supervising the safety of my company requires a lot of preparation and attention to the tasks, incorporations to the safety system and observations on the safety procedures of the workers and the technological equipment of the company. To accomplish these objectives I need to have a notebook to record each procedure and observation, and then use these notes to produce ideas and internal policies on corporate security. Evernote is undoubtedly my favorite digital notebook, and it is the one I use daily in my work because it has many tools that make it very useful to record activities, irregular events, pending tasks and group observations, which I use to make my business security proposals in addition to making corrections on administrative procedures in business security matters. I really like using Evernote in my work because it is the most used digital notebook in the current market, so it always has permanent updates, which help to perfect the tools that Evernote offers you. Another aspect that makes this software very valuable is that it can be used in several operating systems, whether android, windows, iphone, ipad, and in all has a great performance, all these attributes are combined with a flawless interface and easy to use, making Evernote the best digital notebook of all. The more I use this software in my daily tasks at work, the more I feel attracted to Evernote. I have had the opportunity to use each of the tools that Evernote has in my work achieving excellent results, and achieving work goals that, before using this software, I did not achieve so quickly. I feel very satisfied with each one of the features that Evernote offers me, and I have no negative comments about this great software. Whenever I have the opportunity, I recommend to my colleagues and workers the use of this software, because it is very comprehensive and has very effective tools that will allow you to do your job, registering in Evernote each of the eventuality and ideas you need. This software comfortably replaces the old physical notebooks. I recommend you to use Evernote in your pc, android, ipad and iphone, you will achieve excellent results in your work. To meet each of my work objectives, I have all the software I need, and Evernote is present daily in my work performance, allowing me to achieve my work goals while maintaining high quality standards. I can affirm that thanks to the use of Evernote in my work, I have been able to enhance my skills, the fulfillment of my tasks, and the resolution of many problems that arise on a daily basis when I have to coordinate the safety of the workers and technological equipment of the company where I work. Evernote has made me a more qualified and professional worker. "Manage All Your Documents with Ease"
I love the ability to keep all my documents in one place. I use this program with multiple devices, which allows for the ability to engage with my studies at any given time and in any given situation. It is a must for students and researchers alike. I only wish that Evernote had the option to expand the screen as OneNote does. Despite having better snying and connectivity, this is the only point where Evernote falls short. Despite this flaw, it is still an extremely useful tool for my graduate studies. My recommendation would be to watch a YouTube tutorial in order to learn all of the functions of this program. Otherwise, you might be missing out on some of the most useful features that Evernote has to offer. I am solving the issue of carrying around too many books, notebooks, and paper. I can digitalize everything and not have to worry about losing any important documents. "A great personal and business Organizer"
The best thing about evernote is that it allows you to maintain an organization and a balance between your personal and work life, the truth is a very useful tool to have organization of the activities that we must carry out during the day and not only that, but it allows you to do not forget absolutely nothing, which is very important when working in the sales area, I really like the form and interface of the application, also the fact that it can be used either from the computer or from a mobile. I think the only thing I do not like is that it is necessary to add if we want to use the service without Internet access, but the truth is if you have a very good connectivity that does not fail, this really is not important. The truth is that in this section I do not know any application that can even offer something similar to this, I think it is a very complete and beautiful application graphically, that any person in any area will be useful, including at the student level. It has been useful to keep organized all the sales and shipments that I need to carry out and not only that but it is useful as an agenda, and for punctual reminders of activities that go out of your routine and that run the risk of being forgotten in a day busy, really is very good use that can be given to this tool, I feel it is incredibly useful and even if you want to buy the paid version, this seems quite accessible. "Much more than a simple notebook, Evernote is an effective organization available to everyone "
"I have to admit that this is an amaizing software. I really like it!" I love Evernote because you can organizate your things, and well it is also very necessary in my work because I can organize my daily activities and besides their system is easy to use, also you can sign in Evernote and you can have a free account on it and something about it that I like is you can do groups and you can add people who has hotmail or gmail to send differents things like pictures, files, etc . This software is very versatile and so useful and I really like it. Well, I have not had any problems with it I really like it so much. Well, I absolutely can recommend this, it has served me a lot. It has served me a lot to or organize my days and all my things, and it reminds me some importants events on my schedule at my work. "Evernote, do not forget anything!" With Evernote I write down everything that I need to remember as part of my web design job since in this type of work it is necessary to memorize many details about different projects it is very difficult to forget things and with Evernote I do not forget anything, I also use it to store the password of the servers temporarily, normally during the time that a project lasts to be finalized. The notes can be ordered by the creation date which is very useful to look for when you have an important number of notes created. We can also use Evernote on different devices such as computers, browser and mobile phone or tablet. Using a single account we can see the same information on all our devices since the data is synchronized immediately. The new web version of Evernote is not available for Firefox, it seems incredible that they launch an "incomplete" product and leave without the possibility of using it to a significant number of people. These things are very annoying because they force me to install and use a browser that I'm not used to using just for one application. The application is very useful if you have a job in which you need to take many notes or temporarily save information and do not want to create dozens of files on your computer to write down some words. In addition, the free version offers the most basic and necessary for most people. For work reasons I need to store notes constantly especially users and passwords in each new project, in addition to other information related to the project, previously I pointed all this in text documents but with Evernote I can point it in your web application and then send it or share it using my mobile device Everything is much more comfortable in this way since previously you had to send the documents by mail. Me gusta mucho Evernote. Tiene software de escritorio, app y también se puede acceder desde la pagina web, por lo tanto puedo crear notas y editarlas desde cualquier dispositivo. Se sincronizan automáticamente por lo que si estoy creando una nota desde mi Smartphone fuera de casa, quizás agregando algún archivo multimedia y quiero continuar en casa desde la comodidad de mi PC, puedo hacerlo facilmente. Es realmente útil para escritores. Al parecer tiene una capacidad limitada de almacenamiento pero por ahora no he tenido problema con eso y cuando lo tenga, lo más probable es que pague por la versión Premium porque realmente es un buen software. Lo recomiendo con los ojos cerrados a escritores, es una herramienta excelente para trabajar desde cualquier parte del mundo, manteniendo un flujo de trabajo contínuo. Tomo notas todo el tiempo, de cualquier tipo, incluso lo uso mucho para organizar mi agenda diaria. Cuando me llegan ideas me gusta tener a la mano siempre la aplicación para anotarlas y no olvidar nada. I always take notes of the things I need to do and the day I have to deliver them and everNote helps me a lot in this, since it is my work assistant, because thanks to this software I have all my information organized and available whenever I need it. When the internet is poor, notes are not saved quickly, so the process becomes slow. If you need to take notes at work or in your daily activities, I recommend EverNote, because it will help you to have the information available at all times. EverNote benefits me by making me more productive in my work, thanks to the organization that provides me and the ease it affords me by allowing me to access all the files of notes that I have stored in this application from any device and also because it reminds me of the activities that I must do, because with its integrated reminder I am always up to date with the assigned work. "Manage your notes with the best EverNote application. " I really like this application because I can access them from any electronic device, it is also economical to use this application, and when you start using it, it becomes the best information storage application. I consider that this application has become my digital notebook. Very useful and easy to use. What I dislike about this application is that the free version is limited, in addition to access this application I must have access to the internet. I recommend it because it is a very useful application, easy to use, and inexpensive, in which I can manage your notes and have access to them at any time of the day. You can also save files from other programs such as Word Excel or power point. I consider it as an excellent block of notes ideal for all users. It has solved problems in my company because it allows all users of this application to have a good management of their ideas, also in quick moments you can add audio notes, which are very useful so that you do not miss any information and You can save it quickly. It has benefited me because I can store any type of information. Using evernote in my work has made me a more efficient, responsible and productive person. Tiene un software de escritorio y un app, además puedo acceder en línea a través de la página y todo se sincroniza automáticamente. A medida que escribo una nota, ésta se guarda al instante, no tengo que recordar guardar cada cierto tiempo por miedo a perder lo que escribo. Me gusta mucho la organización por libretas y el uso de etiquetas. Ambas cosas me permiten ubicar mis escritos de forma rápida, también gracias al buscador que, con cualquier palabra que contenga el texto, me permite agilizar la búsqueda. No tengo quejas. La verdad me gusta mucho. Es, para mi, la mejor aplicación para guardar y organizar las notas. Evernote es el mejor software de notas que existe. Lo recomiendo 100%. Evernote es mi aliado indispensable. Lo uso para mis escritos personales y también en mi trabajo como asesor de tesis y de proyectos académicos. Lo tengo tanto en mi Smartphone como en mi PC así que llevo mis notas a todos lados y si quiero escribir algo en el teléfono y continuarlo en la PC cuando llegue a casa, puedo hacerlo sin problemas. "With Evernote say goodbye to the annoying physical agendas and notebooks "
Since using Evernote I have had an increase in my work efficiency. With this software I no longer have to worry about taking my notebook to all places or having a pencil on hand to write down all the details I want from work meetings, just logging into my Evernote account from my cell phone and I can record all the notes I need from my meetings, I can also set dates for meetings, place reminders to do my work activities, in short, Evernote is an excellent digital agenda that I use every day and is my fundamental support to keep track of my activities at work. It is very comfortable and easy to use, so I always depend on it to accomplish my tasks at work. It is a very complete digital diary, is the most used worldwide and therefore has enough support and updates that make it the best digital diary of all. It is very easy to use and you can link it to your email account, so it makes it essential to develop your work activities. So far I only have positive impressions of Evernote. A software that is very useful for any worker regardless of their specialization or type of company where they provide their services. This digital diary makes it much easier to take notes in meetings, comments of your bosses, or ideas that you don't want to forget. Without a doubt it is a great tool for workers and companies. My performance as a worker has become more practical and efficient thanks to this software. With Evernote I minimize the effort to transcribe my notes taken at work, besides it has facilitated the processes to take notes necessary for the development of my daily reports. It is an agenda that has made me improve as a worker and I would not stop using it for anything in the world. "Keeps me organized across all devices." I have been an Evernote user since 201 and am currently on the Premium plan. What I love the most about Evernote is being able to start a thought on my phone then finish flushing it out once at my computer (with a keyboard) and not miss a beat. Although familiarity is one of the main reasons I continue to use it, I have to say, after all these years I've only had one situation that made me want to melt into tears because I was unable to recover something I had just typed. The system has been very reliable and stable. At times I wish there were folders that I could hide, but I really wish I could export notes in a format other than xml. I'm pretty sure it's a security thing, but over seven years, I've definitely accumulated a lot of notes that contain incomplete thoughts. I don't want to totally get rid of them, but would love to clean up my account a little bit. On the business side, Evernote is great for my content outlines and drafts. Being able to write and not be tied to any particular device or space is invaluable to me. Go for the upgraded account so that you can have history control options. Also, shaky wifi can interrupt syncing, so be mindful of that. On the business side, Evernote is great for my content outlines and drafts. Being able to write and not be tied to any particular device or space is invaluable to me. The voice recording and attaching files also makes for great features that help me keep everything together. "A digital diary tailored to my work requirements"
In order to fulfill my working day I need several software and the options and functions that they offer me, but, among all these software, the one that I use most frequently is Evernote. The reason is very simple, Evernote is a very complete digital diary that is easy to use and that I can activate and use everywhere. Since I can use it from my android cell phone, Evernote is that software that I never stop using whether it's to attend work meetings, meetings with my work team or my bosses. With this agenda I take notes of the most outstanding points, instructions from my bosses or documentary notes that I use later to make my reports and the programming review grid. In the television channel where I work, it is very important to take permanent notes of the programming that we mount, or the observations on the type of programming, the schedules of each of the programs and the new additions suggested by our users, for these reasons I always take notes in Evernote. When I use a software I evaluate each of its tools, functions, benefits and negative aspects in order to know if the software is really functional for me. When I did this with Evernote I was able to verify that it is a quite complete software, that it is quite useful for the fulfillment of my labor activities and it is quite easy to use, for that reason I continue using it, because I don't find weak points in this software. Nowadays, anyone who belongs to a company must have an agenda. The heavy workloads and obligations in companies mean that workers need tools that allow them to keep track of each of their activities without losing any detail. Evernote is a software that helps a lot to accomplish these activities in your work, and I recommend it. My speed and job performance to culminate my activities at work is the greatest benefit I can mention from this software. Since I use Evernote I have been able to witness that I can systematize each one of my notes, activities to run, make notes on additions that I must make to my reports and the content of the channel programs and other activities. Evernote has made me as a worker have improved my approach procedures and that makes me feel much more prepared and confident of my work product. "The best all-in-one note application"
I Evernote mainly for its simple yet very productive engine. It has all functionality I ever needed - lists, check-lists, bullets, all kinds of alerts and I also can add pictures to my notes. Once I forgot to bring my phone to an outdoor meetings so I took my notes on the paper and then when I returned back it was so easy to just create new note in Evernote, add details, add call date etc and then i just took a picture of my hand note and put that there. Easy, simple, functional. Also, it's very light application, I haven't experienced any issue with unexpected crashes or anything like that. I appreciate that very much. There is also ability to add voice memos, which I use often. To be honest, there is nothing I can say I dislike. But, I'd prefer to have more functional part for alert and also integration with other mobile software. Please try it and you'll fall in love. This is now my must have for quick notes as well as some mid-term planning. Works perfectly. All kinds of notes, planning, personal notes, lists, etc. "easy to use, keeps me organized"
I really like how you can have different kinds of notes. I use voice notes for when I'm driving or have a quick idea, I used text notes most of the time, and uploading documents to the relevant notes (PDFs, Word, things like that) keeps reference material close by so I don't have to look all over for it. Organizing notes within Notebooks (which is the organizational level above Notes) is tough, it's pretty much just by modified date and you can't do more than adding tags to it. There is an additional organizational level (Stacks, which is above Notebooks) but that's all you can do organization wise. So, if you're used to a folder style of organization, it'll take a little getting used to this style. Evernote is my repository of everything. Every idea that I want to possibly pursue later, every active project, even personal things like errands to run, I put there. I don't have to worry about looking all over for something, I know it somewhere within Evernote. And, since I've organized it well, it saves time. For example, I keep a list called "waiting for" for each person I've emailed or called but haven't gotten a reply yet. "The best application to register your personal information and take it everywhere"
The problem with Evernote is that there is no version for free software such as Linux, but it can be accessed through the Wine emulator. In our company Evernote has been very useful since you can take audio and written notes of the conferences that are dictated. The assistants to the workshops and courses that we dictate have the program in the portable computers that we provide them, being able to accede to their personal accounts of Evernote and register the data and the information that interests to them more. They can in turn take pictures of the diagrams and graphics that are shown on the boards and save them as an image in their accounts. For our employees the application has been very useful to achieve the registration of all the tasks and assignments that must be carried out quickly and safely thanks to the compatibility with touch screens that it has in the Windows version. "A digital diary that allows me to successfully complete my working day "
Evernote has everything you've been looking for in a digital diary. In my work I have been able to use it permanently and it is my great ally to fulfill my objectives and work goals. On the one hand, Evernote has a variety of note-taking tools that make it one of the software I use most in my job. This digital diary I use to take notes of important information that I gather at work, allows me to record activities, reminders to perform work tasks, take notes of important activities and then make reports and proposals needed to improve my working conditions. In addition to all these benefits mentioned, Evernote has a very complete and colorful interface, which makes it very easy to use and anyone, without computer knowledge, can use it without problems. Evernote is my ideal software. It's software that has everything you've been looking for. Taking notes of the meetings I attend, the aeronautical activities I must cover and the instructions of pilots and supervisors from the comfort of my phone is something I value very much, and Evernote allows me to do this, creating in me a sense of satisfaction. Evernote is a perfect digital diary for me and I have no negative comments about it. I have no doubt, this software is recommended to all professionals and workers regardless of their specialty, as Evernote allows you to take all the notes you need from the comfort of your phone, making it very easy to develop reports, proposals and reports of activities. My professional growth through the use of Evernote is clear, notorious and recognized by my co-workers and supervisors, as using it in my work environment makes my job easier to do and in turn makes it much easier. I can't imagine my work dynamic without Evernote. "The best note app on the market"
Evernote is the best application for taking notes available in the market. It's more complete than Google Keep or OneNote. With Evernote I can add audios, files and images to each note. With the notebooks I can organize them by task or meeting, even by date of creation of the note. I can also synchronize each note with my cloud and access them from any device from the web without installing any client. Being able to share the notes is also very useful, because when we hold weekly advance meetings and brainstorms are developed it is very good to have the notes of all the participants available. I would like you to add the possibility of placing videos or at least GIF in the notes. The rates applied since last year have gone up a lot and you have to pay a lot of money to have a storage level for the number of notes that I make every day. Evernote I recommend 100% is a great acquisition for any business. With this application I will not forget anything, I work as Project Manager and in this field many meetings are held daily, which I must document precisely and this tool is my main workhorse. I can be certain that any note you add is saved and can be reviewed after the meeting is over. Evernote increases my efficiency and I can develop more projects per month, increasing my profits. "Title: your notes are safe. " What I like most about this application: this application is very useful in everyday life, evernote allows us to store all those notes that we should not forget, you can even record your voice and image in video or audio notes. your notes will be available on your computer or mobile device and on the Evernote servers at the same time. What I dislike about this application: I do not like it to be paid, the application is really good, but you have to pay to guarantee its continuous use . Because I would recommend this program: evernote is characterized by being a computer center where you can store all kinds of information, in addition to each of the notes you upload, it can be backed up by an image, a video or a file, to make the information more versatile . As the application has solved problems, in our company: in our company it has generated greater efficiency, at the personnel level, since this application does not give us the option to forget, it allows you to remember all the tasks that you must perform in your day to day. You can classify the information that you keep according to the genre by notebooks. What benefits it has generated: it is a very easy application to use, it has many benefits since it allows us to store, images, videos, files and notes. evernote speaks your language and if you make a mistake, it corrects you, so you do not have orthographic errors in public. What I like most about this application is that it allows me to take notes and gather everything that really matters to you from your computer or mobile device, synchronized so you can see it at any time. It is the most used today, which helps in the integration work in the company. what I dislike about this program, the free version is limited. Only in the paid version can you save Word, Excel files, etc. The synchronization of the files sometimes fails, by using computers that are not very powerful, or by trying to load very heavy files. In the Ipad Evernote shows you the notebooks to sort the notes, but not the labels, which you must learn almost by heart. It is multi-device, I personally have it on the iPhone, iPad and computer. It is wonderful to access content in different media. Although I want to clarify that sometimes synchronization between devices fails. It is free in all its supports. It has paid versions, but the basic version is perfect to start. It's easy to useBut without a doubt, I recommend Evernote. A program that will help you a lot. Evernote is a very useful program for any company, it is one of the essential programs to improve our productivity. There are other applications, some better, others worse, but given the popularity of Evernote, this has become the reference. Investigate more effectively and share it with your colleagues and friends. This is one of the greatest faculties that Evernote has. It is very simple to install and use. That yes to extract the maximum potential can be more complex. "Having notes at hand Never was so simple"
The truth is that it is a fairly simple and basic application whose main function is to store notes, it is simple to use and I like that you can store photos and small files along with the notes that we have there, it is ideal to avoid forgetting things important that we have to do in our day to day, besides that it is a free tool or with a free version that in most cases meets perfectly. As for the bad, the only thing is that on one occasion I lost the notes that were stored there and when they contacted the technical support they answered very late, but after several days my notes returned so I supposed it had been a conflict with the platform. But the truth is that outside of that small inconvenience, I have not had more problems. I recommend it a lot in my opinion in terms of applications of this style is the best I have used, in addition to the interface of the application is very nice visually and has their respective desktop versions as for smart phones with Android or IOS, is very complete in the area it covers. It has been incredibly useful to me to organize the things I need to do and avoid forgetting some very important tasks, the truth is that in the weeks of work where the tasks have no limits, this application becomes your friend. "Easy to use and very useful software to keep notes at work"
I've always wanted software like this to work with. Evernote is an incredible digital diary that I use every day in my work since there are many notes that I have to take about meetings with both my bosses and clients. It is a very easy to use digital diary, has a very nice interface to the eye, which specifies each of its tools to use them correctly, has an application for smartphones which makes Evernote use anywhere you want, and I can synchronize my notes to save them and use them later. In my work I use this agenda daily to take notes of meetings, chemicals and substances approved by our institution for commercial distribution and the comments and observations of my bosses for the execution of their instructions. I could not mention a single complaint about this software, as it came into my life to facilitate my functions and work, I no longer have to be writing anything on sheets or notebooks, but I use Evernote on my smart phone and record each of the daily vicissitudes in my work, is a digital diary that greatly facilitates my work. For those professionals who require an agenda to record all their activities and have them stored for later use in their research reports or report of activities, because this software will be ideal for you. An agenda that fits perfectly to current work demands. In my work is essential the use of my Evernote agenda, thanks to the fact that I have this software has made it much easier for me to record each of the observations I am taking in the meetings. This agenda allows me to write down each one of the details necessary to prepare my reports. A software that has allowed me to strengthen my qualities as a professional. it is excellent to organize your daily tasks, to take important annotations of the work or of the university the best thing of all is that you can create several folders and add your notes by category.